Dunsborough Physiotherapy Centre supplies Post-Surgical Rehabilitation to Dunsborough and the surrounding areas using the latest physiotherapy techniques and technologies. Dunsborough physio staff will ensure a rapid and full recovery following surgery. Post-Surgical Rehab: If you have required surgical intervention following an injury, or due to degenerative change, our physiotherapists at Dunsborough Physiotherapy Centre are able to deliver high quality post-surgical rehabilitation to speed your recovery. Our Dunsborough physios are aware of the most up-to-date rehab protocols, and will supply a physio rehab program specific to your surgery, and your surgeon's protocols. We are able to supply hands-on treatment using physiotherapy treatment techniques designed to relieve pain, decrease swelling, increase movement, and improve muscle strength. At Dunsborough Physiotherapy Centre we also offer one-on-one hydrotherapy, pilates, massage, and physiotherapy-supervised individually-designed gym programs (incorporating strengthening, stretching, joint range of movement and proprioception exercises). Our Dunsborough physios are able to accurately monitor your progress with cutting-edge technology: goniometry to assess joint range of motion and flexibility, hand dynamometry and push/pull dynamometry to assess muscle strength, real-time ultrasound to assess core-strength and pelvic floor activation, and electromyography to assess muscle activity and strength. Our physiotherapists are able to accurately assess you biomechanics and address flaws in technique which increase the risk of re-injury. Most post-surgical rehabilitation programs consist of different stages which relate to the healing times required for different tissues affected by the surgery. The exercises given during each stage of post-surgical rehab are designed to restore movement, strength, flexibility, proprioceptive function and functional ability, without damaging the surgical repair. It is important for the patient to follow post-surgical protocols accurately and to be monitored by a physiotherapist to ensure exercises are done correctly and progressed appropriately. Pre-habilitation (Pre-hab) services are offered pre-surgery by Dunsborough Physiotherapy Centre. Recovery times following surgery can be improved if a pre-habilitation program is followed incorporating targeted strengthening exercises, stretching, joint range of movement exercises, and proprioception exercises. Our Dunsborough physio team can assess areas of concern and fashion a prehabilitation program prior to your surgery to improve outcomes post-surgery. Having surgery or recently had surgery, and want to know the finer detail of your procedure?.....Listed below are links to a number of youtube videos of orthopaedic surgeries which are rehabilitated at Dunsborough Physiotherapy Centre. Included are both computer-animated versions and "real-life" versions of different surgeries which have been hand-picked by our physiotherapy staff. Be aware that some people will find the "real-life" surgery video footage distressing. If this may be the case for you, the computer-animated versions may be the best option. If you have any queries regarding surgical procedures seen here our physio staff at Dunsborough Physiotherapy Centre and more than happy to give assistance. Closed Reduction: a surgical procedure to restore a fracture or dislocation to the correct alignment (normal anatomical position) without surgical exposure of the bone/s . Open Reduction: a surgical procedure to restore a fracture or dislocation to the correct alignment (normal anatomical position) with surgical exposure of the bone/s . ORIF (Open Reduction and Internal Fixation): An open reduction and internal fixation (ORIF) is a type of surgery used to fix broken bones. This is a two-part surgery. First, the broken bone is reduced or put back into place. Next, an internal fixation device is placed on the bone. A broken bone must be carefully stabilized and supported until it is strong enough to handle the body's weight and movement. During ORIF (a surgical procedure to set a fracture), the bone fragments are first repositioned (reduced) into their normal alignment. They are then held together with special implants, such as plates, screws, nails and wires. Internal fixation allows shorter hospital stays, enables patients to return to function earlier, and reduces the incidence of nonunion (improper healing) and malunion (healing in improper position) of broken bones. The implants used for internal fixation are often made from stainless steel and titanium, which are durable and strong. Types of Internal Fixation: include bone screws and metal plates, pins, rods, Kirschner wires, pins and intramedullary devices such as the Kuntschner nail, and interlocking nail. Nails/Rods: in some fractures of the long bones the best way to hold the bone pieces together is by inserting a rod or nail through the hollow center of the bone that normally contains some marrow. Screws at each end of the rod are used to keep the fracture from shortening or rotating, and also hold the rod in place until the fracture has healed. Rods and screws may be left in the bone after healing is complete. This is the method used to treat the majority of fractures in the femur (thighbone) and tibia (shinbone). Wires/Pins: Wires are often used to pin the bones back together. They are often used to hold together pieces of bone that are too small to be fixed with screws. In many cases, they are used in conjunction with other forms of internal fixation, but they can be used alone to treat fractures of small bones, such as those found in the hand or foot. Wires are usually removed after a certain amount of time, but may be left in permanently for some fractures. Plates: plates are like internal splints that hold the broken pieces of bone together. They are attached to the bone with screws. Plates may be left in place after healing is complete, or they may be removed (in select cases). Screws: screws are used for internal fixation more often than any other type of implant. Although the screw is a simple device, there are different designs based on the type of fracture and how the screw will be used. Screws come in different sizes for use with bones of different sizes. Screws can be used alone to hold a fracture, as well as with plates, rods, or nails. 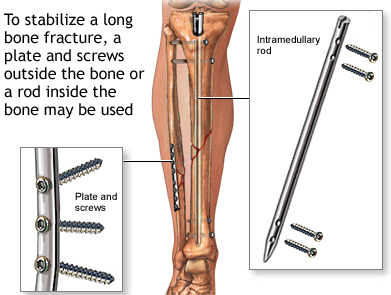 After the bone heals, screws may be either left in place or removed. 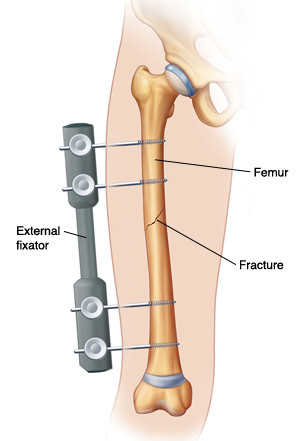 External Fixation: An external fixator acts as a stabilizing frame to hold the broken bones in proper position. In an external fixator, metal pins or screws are placed into the bone through small incisions into the skin and muscle. The pins and screws are attached to a bar outside the skin. Because pins are inserted into bone, external fixators differ from casts and splints which rely solely on external support. In many cases, external fixation is used as a temporary treatment for fractures. Because they are easily applied, external fixators are often put on when a patient has multiple injuries and is not yet ready for a longer surgery to fix the fracture. An external fixator provides good, temporary stability until the patient is healthy enough for the final surgery. Other times, an external fixator can be used as the device to stabilize the bone until healing is complete. There may be some inflammation or, less commonly, infection associated with the use of external fixators. This is typically managed with wound care and/or oral antibiotics. 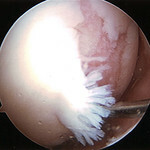 Arthroscopy is the examination of a joint, specifically the inner structures. The procedure is performed by inserting a specifically designed illuminated narrow tube containing a fiber-optic video camera through a small incision (about the size of a buttonhole). This instrument is called an arthroscope. The procedure of arthroscopy is primarily associated with diagnosis. However, when a repair is performed, the procedure is called arthroscopic surgery. Arthroscopy allows the surgeon to see inside a joint without having to make a large incision. Surgeons can repair some types of joint damage during arthroscopy, with pencil-thin surgical instruments inserted through additional small incisions. There are different surgical options available when repairing torn ligaments. The goal of surgery is to restore normal stability to a joint and take away pain that is associated with instability. Surgery is considered when you have joint instability that does not respond to non-surgical treatment. Physical examination performed by your physiotherapist can reveal joint instability due to ligament insufficiency. Scans such as x-ray, ultrasound, CT scan and MRI are used to help with diagnosis. Some of the options include repairing the torn ligament with stitching if the ligament is in reasonable condition. Ligaments can be tightened via stitching / bone anchors. Other tissue can be used to reinforce the ligament, which improves joint stability. Another option is to use a tendon to replace the torn ligament/s. A well known surgery which uses this principle is a knee reconstruction (ACL repair) which commonly uses the hamstring / gracilis tendons to replace the torn anterior cruciate ligament (ACL). The Broström operation is a repair of damaged ligaments on the outer (lateral) side of the ankle. It is designed to address ankle instability. More importantly, it is primarily used to repair the ATFL (anterior talofibular ligament) in the ankle. Artificial ligaments are surgical implants designed to compensate for the Ioss of natural ligaments (must often due to a trauma) or to serve as reinforcement for healing soft tissue. LARS is a range of synthetic ligament augmentation and reconstruction devices, suitable for a wide variety of applications including knee reconstruction (ACL, PCL), ankle joint stabilisation, and shoulder repairs. LARS ligaments are intended for the intra or extra-articular reconstruction of ruptured ligaments, designed to mimic the normal anatomic ligament fibers. The intra-articular longitudinal fibres resist fatigue and allow fibroblastic ingrowth, the extra-articular woven fibres provide strength and resistance to elongation. LARS ligaments can be used in conjunction with the remnants of a ruptured ligament, or as reinforcement of an autologous reconstruction. In both cases, LARS ligaments allow the original ligament tissues to heal during the immediate post-operative period, when an excess of traction would otherwise elongate / damage the tissue. LARS ligaments can be used for extra-articular reconstructions including tendon repairs such as Achilles tendon, patella tendon, biceps tendon, and rotator cuff tendons. Stabilisation surgery involves improving the stability of a joint so as to lessen the chance of further subluxation / dislocation, joint damage and pain. Joints commonly requiring stabilisation surgery include the shoulder (gleno-humeral) joint, acromioclavicular joint, patello-femoral joint, ankle joint, wrist, thumb, and the spine. Surgical techniques used involve the tightening of stretched tissue including the joint capsule and ligaments which support the joint, repairing damaged stabilising structures such as ligaments, tendons and the labrum (in the hip and shoulder joint). Releasing (cutting) tight tissue may be required (such as a lateral retinacular release in patellar stabilisation surgery) to allow for better alignment, which lessens the chance of further dislocation. Ankle Ligament Reconstruction: the goal of this surgery is to restore normal stability to the ankle and take away pain that is associated with an unstable ankle. Surgery is considered when you have an unstable ankle that does not respond to non-surgical treatment. Six months of nonsurgical treatment is often recommended before surgery. A physical examination will show that the ankle is unstable, and X-rays are sometimes used to help with the diagnosis. Several different techniques can be performed depending on the individual patient. One option is to repair the patient’s own existing ligaments with sutures. This repair is often made stronger by support from other tissues. This is referred to as the modified Bröstrom procedure. The modified Bröstrom procedure is the most commonly performed surgery for ankle instability. The surgeon begin​s by making a C- or J-shaped incision over the outside of the ankle. The ankle ligaments are then identified.The ligaments are tightened using either stitches or anchors that are positioned within the distal fibula. Tightening tissue (the inferior extensor retinaculum) over the repaired ligaments further strengthens the repair. Another option is to use a tendon to replace the torn ligaments of the ankle (such as hamstring / cadaver tendon): the surgeon weaves a tendon into the bones around the outer aspect of the ankle. The tendon is held in place with stitches / screws inserted into bone. Tendons from the lateral side of the ankle can also be weaved into the fibula bone to create a more stable ankle. ACL reconstruction is surgery designed to rebuild the anterior cruciate ligament situated in the centre of your knee. The anterior cruciate ligament (ACL) keeps your shin bone (tibia) in place in relation to the thigh bone (femur). A tear of this ligament can cause your knee to give way during physical activity. If you don’t have your ACL reconstructed your knee may continue to be unstable. This increases the chance of developing a meniscal tear. ACL reconstruction may be recommended to you if the knee gives way or feels unstable during daily activities, if there is persistent knee pain and swelling during and after activity, if other ligaments around the knee are damaged, or you are unable to participate in sport due to dysfunction. The tissue used to replace your damaged ACL will come from your own body (autograft) or from a donor (allograft). The two most common sites to take tissue from are the quadriceps (knee cap) tendon or the hamstring (semitendinosus) / gracilis tendons, found behind the knee. The ACL reconstruction procedure is usually performed via arthroscopy: your surgeon will make small cuts around your knee and insert medical instruments / a camera into the joint. Any other damaged tissue will be repaired / removed prior to the ACL repair. Following this, the torn ligament will be removed with a shaver or other instrument. Next, the autograft (quad tendon / hamstring / gracilis tendons) will be removed and prepared. Using a drill, tunnels in your thigh / shin bones are made to allow for the new tissue to be brought through the centre of the knee. This new tissue will be in the same place as your old ACL. The new ligament is attached to the thigh / shin bones at either end with screws / buttons or other devices to hold it in place. As it heals, the bone tunnels fill in. This holds the new ligament in place. Following surgery an extensive physiotherapy rehab program needs to be followed diligently. Depending on the sport you are to return to you, your recovery time may be as long as 12 months. Total / Partial joint replacement is a surgical procedure in which parts of an arthritic or damaged joint are removed and replaced with a metal, plastic or ceramic device called a prosthesis. The prosthesis is designed to replicate the movement of a normal, healthy joint. Hip and knee replacements are the most commonly performed joint replacements, but replacement surgery can be performed on other joints, as well, including the ankle, wrist, shoulder, and elbow. A joint is where the ends of two or more bones meet. The ends of bone which form the joint surfaces are covered in cushioning low-friction tissue called hyaline cartilage. The ends of bone are held in place by tough fibrous tissue called ligaments. The joint fluid is created by and housed in the joint capsule. There are different types of joints within the body. For example, the knee is considered a "hinge" joint, because of its ability to bend and straighten like a hinged door. The hip and shoulder are "ball-and-socket" joints, in which the rounded end of one bone fits into a cup-shaped area of another bone. Several conditions can cause joint pain and disability and lead patients to consider joint replacement surgery. In many cases, joint pain is caused by damage to the cartilage that lines the ends of the bones (articular cartilage)—either from arthritis, a fracture, or another condition. If non-surgical treatments such as medication, physiotherapy, and changes to your everyday activities do not relieve your pain and disability, joint replacement surgery may be recommended. During joint replacement surgery, the damaged cartilage and bone is removed from your joint and replaced with prosthetic components made of metal, plastic, or ceramic. The prosthesis mimics the shape and movement of a natural joint. For example, in an arthritic hip, the damaged ball (the upper end of the femur) is replaced with a metal ball attached to a metal stem that is fitted into the femur, and a plastic socket is implanted into the pelvis, replacing the damaged socket. Hemiarthroplasty surgery is the replacement of half of an affected joint. In the shoulder and the hip this normally involves the replacement of the humeral / femoral head (ball) of the ball and socket joint. This surgery is often indicated following a fracture involving the femoral / humeral head. In the knee, hemiarthroplasty (unicompartmental knee arthroplasty) is typically performed for medial osteoarthritis. Advantages of the procedure include preservation of uninvolved tissue and bone, reduced operative time, better range of motion, improved gait, and increased patient satisfaction. Unicompartmental knee arthroplasty may be preferable to high tibial osteotomy (HTO) in relatively young patients with medial compartment arthritis. Careful patient selection is critical for unicompartmental knee arthroplasty if reliable results are to be achieved. The arthritis should be predominantly confined to a single compartment. No significant degenerative changes in the other (medial, lateral, or patellofemoral) compartments should be present, and both cruciate ligaments should be intact. The operation is also indicated in patients with osteonecrosis of the femoral condyle. Not all of the unicompartmental replacements are suitable for the lateral side, because the ligaments of the lateral compartment are more elastic than those of the medial side. Malalignment of the limb should be passively correctable to neutral and not beyond: this usually is possible in patients with a varus deformity less than 15° or a valgus deformity less than 20°. The deformity of the knee should be only mild: a flexion contracture should be less than 15°, and the knee should bend at least 110 degrees. Patients with advanced arthritis of the hip may be candidates for either traditional total hip replacement (arthroplasty) or hip resurfacing (hip resurfacing arthroplasty). Each of these procedures is a type of hip replacement, but there are important differences. The hip is a ball-and-socket joint. In a healthy hip, the bones are covered with smooth cartilage that enables the femoral head and acetabulum to glide painlessly against each other. In a traditional total hip replacement, the head of the thighbone (femoral head) and the damaged socket (acetabulum) are both removed and replaced with metal, plastic, or ceramic components. In hip resurfacing, the femoral head is not removed, but is instead trimmed and capped with a smooth metal covering. The damaged bone and cartilage within the socket is removed and replaced with a metal shell, just as in a traditional total hip replacement. Advantages of Hip Resurfacing: the advantages of hip resurfacing over traditional total hip replacements is an area of controversy among orthopaedic surgeons. A great deal of research is currently being done on this topic. Hip resurfacings may be easier to revise. Because the components (called implants) used in hip replacements and hip resurfacings are mechanical parts, they can wear out or loosen over time. This typically occurs between 10 and 20 years after the procedure, although implants may last longer or shorter periods of time. If an implant fails, an additional operation (a revision) may be necessary. This can be more complicated than the initial operation. Because hip resurfacing removes less bone from the femur (thighbone) than a traditional hip replacement, many surgeons believe it is easier to exchange implants that fail after hip resurfacing. Decreased risk of hip dislocation: in hip resurfacing, the size of the ball is larger than in a traditional hip replacement, and it is closer to the size of the natural ball of your hip. Because of this, it may be harder to dislocate, though it must be remembered that several factors can affect the risk of dislocation, such as surgical approach, and the type and size of the implants used. More normal walking pattern: several studies have shown that walking patterns are more natural following hip resurfacing compared to traditional hip replacement. These differences in walking are quite subtle however. Greater hip range of motion: hip resurfacing patients are usually able to move their hips through a greater range of motion than total hip replacement patients, though certain total hip implants can achieve the same range of motion as hip resurfacings. Femoral neck fracture: a small percentage of hip resurfacing patients will eventually break (fracture) the thighbone at the femoral neck. If this occurs, it is usually necessary to convert the hip resurfacing into a traditional hip replacement. A femoral neck fracture is not possible with a traditional hip replacement because the femoral neck is removed during this procedure, however, fractures around the implants can still occur with a traditional hip replacement. Metal ion risk: in hip resurfacing, a metal ball moves within a metal socket. Over time, this leads to the production of tiny metal particles called ions. Some patients may develop sensitivity or allergy to the metal particles, which may cause pain and swelling. Also, there are concerns that the metal particles may increase the risk of cancer, although this has never been proven. Some types of traditional hip replacements also consist of a metal ball and a metal socket and these replacements run the same potential risks. Hip resurfacing is a more difficult operation: hip resurfacings are more difficult than total hip replacements for surgeons to perform. As such, a larger incision is usually required for hip resurfacing. Unlike hip replacement, hip resurfacing is not suitable for all patients. Generally speaking, the best candidates for hip resurfacing are younger (less than 60), larger-framed patients (often, but not always male) with strong, healthy bone. Patients that are older, female, smaller-framed, with weaker or damaged bone are at higher risk of complications, such as femoral neck fracture. Chondroplasty is a surgical procedure involving the debridement / shaving of articular cartilage: this will hopefully lead to the growth of new fibrocartilage over the damaged area. This is often carried out during an arthroscopic surgery. Chondroplasty is employed when there is mild to moderate cartilage wear. If the cartilage is completely worn the surgeon may traumatise (drill in to / micro-fracture) the exposed bone to stimulate the growth of fibrocartilage. Unfortunately fibrocartilage is inferior to the original hyaline cartilage. More effective procedures involve taking areas of healthy joint surface from other less-important parts of the body and transplanting them into the damaged areas - osteochondral grafting (OATS procedure, mosaicplasty, paste grafting). Attention is currently focusing on growing the patient's own cartilage cells in a laboratory and transplanting them back into the knee (Carticel procedure, Genzyme technique or ACI - Autologous Chondrocyte Implantation). Experimental efforts currently involve growing foetal stem cells in laboratories and encouraging them to form cartilage sheets which can be transplanted into the damaged joint surface (stem cell research). The surgical fixation of a joint by a surgical procedure designed to accomplish fusion of the joint surfaces by promoting the proliferation of bone cells. Arthrodesis surgery is if the joint in question cannot be managed by pain medication, splints, or other conservative treatment methods. The rationale for this type of surgery differs according to the joint involved: ankle arthrodesis is performed for osteoarthritis, rheumatoid arthritis and post-traumatic arthritis; arthrodesis of the knee is usually performed as a last resort for infections (such as tuberculosis) or neuropathic joint pain secondary to diabetes or syphilis. Common joints treated via arthrodesis / fusion include the ankle joint, knee joint, hip joint, hand, foot, and the lumbar spine, and cervical spine. 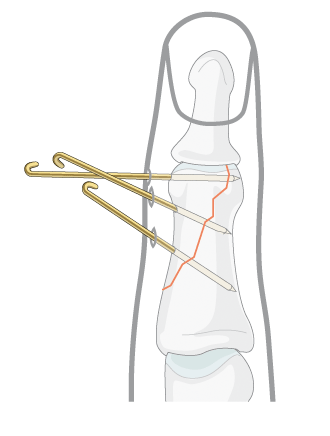 Arthrodesis is usually achieved using some form of fixation device (such as screws) to eliminate motion in the joint, and then following the removal of the remaining cartilage within the joint a bone graft is introduced between the bones using a bone from elsewhere in the person's body (autograft) or using donor bone (allograft) from a bone bank. The fixating apparatus can be, but is not always, removed once fusion has been achieved. Tendon Repair: Tendon repair refers to the surgical repair of damaged or torn tendons, which are cord-like structures made of strong fibrous connective tissue that connect muscles to bones. Tendon damage may be due to laceration, degeneration, or relate to a rheumatological condition such as rheumatoid arthritis which weakens the tendon over time. Common joints affected by tendon injury are the shouilder, ankle, knee, elbow, and hand. Tendon repair involves the sewing together of the torn portion of tendon. If this is not possible a tendon graft may need to be harvested. If required, tendons are reattached to the surrounding connective tissue. In the case of the rotator cuff (shoulder tendons), if the tendons are badly damaged the frayed section of tendon/s is cut back to a clean margin and then re-attached to the humerus (arm bone) using bio-absorbable screws and sutures. Following surgery the patient will need to carefully follow a rehabilitation program monitored by a physiotherapist. The tendon is usually noted loaded heavily until 12 weeks post-surgery. Tenodesis: the surgical anchoring of a tendon to bone. Common tendons which may require this form of surgery include the long head of biceps, the wrist flexors and extensor origins located on the inner and outer aspect of the elbow respectively, and the peroneal tendons which wrap around the outer aspect of the ankle. This surgery is often performed following tearing of a tendon close to it's attachment point to bone. This can relieve pain and dysfunction noted when the damaged tendon is loaded / tensioned. Tenotomy: this is a surgical procedure involving the cutting of a tendon partially or fully (also known as a tendon release or tendon lengthening procedure). Tenotomy is most commonly performed in order to lengthen a muscle that has developed improperly, or become shortened and is resistant to stretch. Prolonged shortened posturing of a muscle can lead to joint contractures which limit the ability of a joint to move though a full range of motion. A tendon release may also be performed in order to relieve pain associated with repetitive tensioning of a damaged tendon (such as the long head of biceps tendon, which is often released during rotator cuff repair surgery). Tenotomy is performed in infants with clubfoot, and in older patients who develop contractures or subluxations from neuromuscular disease, or other conditions. After nerve injury, a nerve will try to repair itself by sprouting regenerating nerve units. These regenerating units will then try to grow down the nerve to reinnervate (restore nervous function to) muscle or skin. If they make a correct connection — motor nerve to muscle or sensory nerve to skin — then recovery of muscle function and skin sensation will occur. However, if the regenerating nerve fibers do not make a correct connection, then no recovery will occur. Nerves regenerate at the rate of about 2cm per month. Although sensation can be regained even after long periods of denervation (loss of nerve supply), muscle reinnervation will not occur after long periods of time without nerve innervation (nerve supply). Therefore, it is necessary to get nerve to muscle as quickly as possible if recovery does not occur spontaneously. Nerve repair: if surgery is necessary, there are several types of surgery that may be recommended. These include nerve repair, nerve graft, nerve transfer or neurolysis. If the nerve has been cut, a nerve repair is used to sew the two ends of a nerve together. This usually is possible when the nerve has been cut sharply. However, in cases with more extensive damage, it may not be possible to sew the two ends of the nerve directly together once the damaged nerve has been trimmed away. In these cases, a nerve graft is used. A small piece of donor nerve is used to bridge the gap between the two nerve ends, and the nerve then will regenerate across this “bridge” to provide recovery. The donor nerve is taken from other areas of your body using small, non-critical, sensory nerves. Nerve Transfer: nerve transfers use functioning nerves that are close to the target muscle or sensory area - the nerves are transferred to the injured area to take over the role of the damaged nerve. This provides a close source of nerve for faster recovery. Neurolysis refers to the removal of scar from the nerve and may be employed if scar tissue is blocking the nerve from regenerating. Nerve transposition: this is a surgical procedure which moves a nerve away from a site where it is being compressed / entrapped. The most common example of this surgery is for ulnar nerve entrapment (cubital tunnel syndrome / ulnar tunnel syndrome) where the ulnar nerve is moved out of the ulnar notch and repositioned in front of the medial epicondyle. Nerve Decompression: nerve decompression surgery is a procedure designed to relieve pressure on a nerve caused by a neuroma or other soft tissue / bony material. Patients suffering from peripheral neuropathy symptoms (numbness, pain, and / or functional loss) due to compressed nerves, who have not found relief through other, more conservative methods, may consider nerve decompression surgery. Surgery involves the removal of bone / soft tissue, and / or the release of tight tissue applying pressure / fractioning the nerve. Spinal fusion, also known as spondylodesis or spondylosyndesis, is a surgical technique used to join two or more vertebrae. Bone tissue, either from the patient (autograft) or a donor (allograft), is used in conjunction with the body's natural bone growth (osteoblastic) processes to fuse the vertebrae. Fusion of the spine is used primarily to eliminate the pain caused by abnormal motion / degeneration of the vertebrae and surrounding tissue. Patients requiring spinal fusion have either neurological deficits (loss of muscle power or sensation), or severe pain which has not responded to conservative treatment. Fusion immobilizes the faulty vertebrae, which is usually caused by degenerative conditions. Spinal fusion is also the preferred way to treat most spinal deformities, such as kyphosis and scoliosis. Spinal fusion is most often performed in conjunction with other surgical procedures of the spine, such as foraminotomy, laminectomy, and decompression surgery for spinal stenosis. Spinal fusion is performed to alleviate symptoms caused by a number of conditions: disc damage (annular tearing, disc bulge / prolapse, loss of disc height, disc dessication), injury or fractures to the vertebrae, a weak or unstable spine caused by infections or tumours, spondylolisthesis (a condition in which one vertebrae slips forward in relation to another), abnormal spinal curvature (scoliosis or kyphosis), arthritis in the spine, spinal stenosis. The fusion site is often fixated by metallic pedicle screws often made from titanium, rods, plates, or cages which stabilize the vertebrae and facilitate bone fusion. The fusion process typically takes 6 to 12 months. Laminectomy is a type of spinal surgery that involves removing bone to relieve excess pressure on the spinal cord / nerve(s) in the lumbar spine. A laminectomy removes or drills away part of the lamina (roof) of the vertebrae to create space for the nerves leaving the spine. 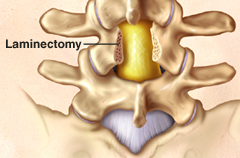 Laminectomy is often performed to treat spinal stenosis. Spinal stenosis is a condition caused by a gradual narrowing of the spinal canal. This narrowing occurs as a result of the degeneration of both the facet joints and the intervertebral discs. The facet joints enlarge as they become arthritic, which contributes to a decrease in the space available for the nerve roots. Bone spurs, called osteophytes also can form and grow into the spinal canal. These processes narrow the spinal canal and may begin to impinge upon and place pressure on the nerve roots and spinal cord, resulting in such symptoms as back pain, pain that radiates into the hips, buttocks and legs, numbness, tingling and muscle weakness in the back and/or lower extremities, aching pain and heaviness in the legs on walking, termed “neurogenic claudication”. The goal of a lumbar laminectomy is to relieve pressure on the spinal nerves by removing the part of the lamina and any other tissues which may be the source of the pressure. The procedure often involves removal of bony spurs and damaged disc material as well as the lamina. A facet joint injection (block), delivered via needle, includes both a long-lasting corticosteroid and an anesthetic numbing agent. The drugs are delivered to the painful facet joint, either inside the joint capsule or in the tissue surrounding the joint capsule. Each vertebra has four facet joints, one pair that connects to the vertebra above (superior facets) and one pair that connects to the vertebra below (inferior facets). Corticosteroid injections can reduce inflammation and can be effective when delivered directly into the painful area. Pain relief can last from days to years, allowing you to improve your spinal condition with a physiotherapy exercise program. Facet injections also provide diagnostic information. 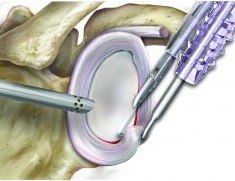 Successful facet injections may indicate that you could benefit from a facetal rhizotomy. Facetal Rhizotomy (Rhizolysis), either cervical or lumbar, is a minimally invasive procedure performed to provide pain relief by stopping the pain signals sent from facet joints to the brain. The pain relief experienced by most patients who have this procedure lasts months or even years. Using a local anesthetic and x-ray (CT) guidance, a needle with an electrode at the tip is placed alongside the small nerves (medial branch) which supply the facet joint. The electrode is then heated, with a technology called radiofrequency, to deaden the nerves that carry pain signals to the brain. When conservative management / regular medication is not able to deliver adequate relief, cortisone (corticosteroid) injections may help relieve pain and inflammation in a specific area of your body (cortisone is a powerful anti-inflammatory). There are many types of injectable corticosteroid including prednisone and celestone. Cortisone injections are most commonly given into joint spaces such as the ankle, elbow, hip, knee, shoulder, spine and wrist. Cortisone injections usually include a combination of a corticosteroid medication and a local anesthetic. The cortisone component of the injection may take 7-10 days to take effect. Often the cortisone injection is guided in via ultrasound or CT scan to ensure the cortisone is delivered into the joint space. The number of cortisone injections you can receive in one year generally is limited because of potential side effects from the medication. In general, cortisone injections should not be given more often than every six weeks and usually not more than three or four times a year. Cortisone is commonly used to treat bursitis, tenosynovitis, arthritis, synovitis and entrapment syndromes (carpal tunnel syndrome, nerve root impingement). PRP (Platelet-Rich Plasma) is produced from a person's own blood. Platelets circulate through the blood and are critical for blood clotting. Platelets and the liquid plasma portion of the blood contain many factors that are essential for cell recruitment, multiplication and specialization which are required for healing. Platelet activation plays a key role in the process of wound and soft tissue healing. The use of platelet rich plasma (PRP) can promote healing of injured tendons, ligaments, muscles, and joints. PRP injections are prepared from one or more tubes of the patient’s own blood. After being centrifuged, the activated platelets are injected into the abnormal tissue, releasing growth factors that recruit and increase the proliferation of reparative cells. Ultrasound imaging may or may not be used to guide the injection. Autologous chondrocyte implantation (ACI) is a procedure used to treat isolated full-thickness articular cartilage defects of the knee. 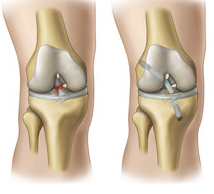 ACI has also been performed for defects of the patella (knee cap) in addition to other joints of the body. Autologous chondrocyte implantation is a two-stage operative procedure. The first procedure is performed arthroscopically. The surgeon will harvest a small piece of articular cartilage from the patient’s knee, typically the size of a five cent piece. This cartilage biopsy is then sent to a laboratory where the biopsy is enzymatically treated in order to isolate the chondrocytes, which are the cartilage-producing cells of the body. Once these chondrocytes are obtained, they are then expanded in number and sent back to the surgeon approximately 6 to 8 weeks later for implantation. The second-stage operation is an open procedure whereby a small patch is sewn over the articular cartilage defect. The chondrocytes that have been harvested and expanded are then injected underneath this patch where they adhere to the patient’s knee to form what is known as hyaline-like cartilage which resembles the native joint cartilage. Following implantation there is a period of restricted weight-bearing for up to 8 weeks. During this time, Dunsborough Physiotherapy Centre physios will work on range-of-motion of the knee and prescribe strengthening activities. Stem cell therapy is the use of stem cells to treat or prevent a disease or condition. Stem cells are predominantly derived from fat, bone marrow or umbilical cord blood. Bone marrow-derived mesenchymal stem cells may be of benefit orthopaedically for cartilage and bone repair, muscle and tendon repair, intervertebral disc degeneration and treatment of arthritis. Many trials are currently underway to assess the effectiveness of these cells in repairing damaged bone, muscle, tendon, disc and cartilage tissue. If autologous stem cell therapy is to be implemented this firstly involves stem cells being taken from the bone marrow (often from the pelvic region) of the patient. These cells are then grown (expanded) in a lab and at a later date injected into the affected area. If stem cell therapy is allogeneic the stem cells are sourced from a donor and injected into the affected area. Below is a list of some of the surgeries rehabilitated at Dunsborough Physiotherapy Centre. Our physiotherapists use the latest evidence-based post-surgical rehabilitation protocols ensuring a rapid recovery following surgery. If you have any specific queries in regards to your procedure do not hesitate to contact us at Dunsborough Physiotherapy Centre.